Poll: Would You Own a Gray Market Kubota? 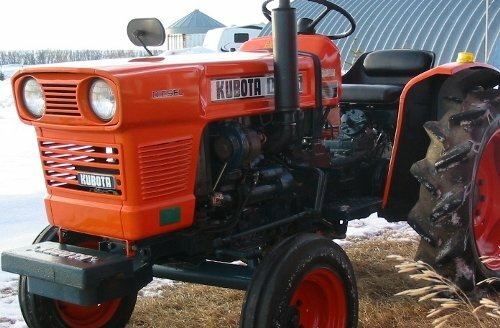 A restored Kubota gray market L1500. Time for another poll that concerns itself less with snow removal and more with how you, readers of OrangeTractorTalks feel about Kubota’s gray market tractors. You know them as the B5001s, B6001s, L1500, L1501 or maybe a L2202 or L1-18 for good measure. Perhaps you have heard rumors here and there – unsafe, ungodly machines. Built in the blazing forges of hell itself. Hey Jim! Thanks for tossing in your thoughts! You are right – a Kubota is a Kubota. We find some dealers get this and are are more “gray friendly” than others. I will present an alternative view, albeit from a UK perspective (some rules may not apply in US). These tractors are designed to work in Japanese paddy fields. Paddy fields are wet and level. As a result the tractors often have larger wheels than European models to raise them up – and being flat this is not a problem. Taking a narrow tractor on raised wheels onto hills they were not designed to work on will increase risk of toppling. Indeed, some people have quoted Kubotas being prone to toppling following a widely reported rollover of a gray market tractor. Of course, you could buy new rims and tyres assuming the gearing would not be affected – but that adds to costs. Which brings me to second point – UK tractors have to have a rollbar / ROPS if they weigh over 600Kg. Most of the Japanese market tractors seem not to have them – and the UK imorters do not seem to retrofit them either (hence aforementioned injury). Of course, you can buy them yourself but that starts to raise costs – and may not be approved anyhow – which may invalidate insurance. Finally, they may not have a type approval for selling in Europe. This can be a problem in some countries (e.g. France) where only approved tractors can be registered for road use. Of course, if you never want to use it on the road this may not be a problem. So – an alternative view – why I would NOT buy one – and hence have a properly imported road legal B1750HST with ROPS. An excellent and completely valid comment Julian! Thank you for sharing! I own a ZB7000 ZenNoh, 2 cyl, 4wd which is similar to the Kubota B6000. When I bought it 10 years ago refurbished for $3500 I had no clue it was ‘Gray’. It looked like new and came with a 42″ gannon and grader blade. After years of hard use it still runs like a Timex. Thanks to orangetractortalks.com I have a better understanding of thier history, parts, & maintenance. I have no problem owning a ‘Gray” Kubota tractor. Thanks for a great web site.